SCVHistory.com | Pico Canyon | The Mysterious Disappearance and Death of Alec Mentry's Father. The Mysterious Disappearance and Death of Alec Mentry's Father. Here's a story that probably didn't make it into the annals of the Standard Oil Co. of California when it absorbed Pacific Coast Oil in the early 1900s. 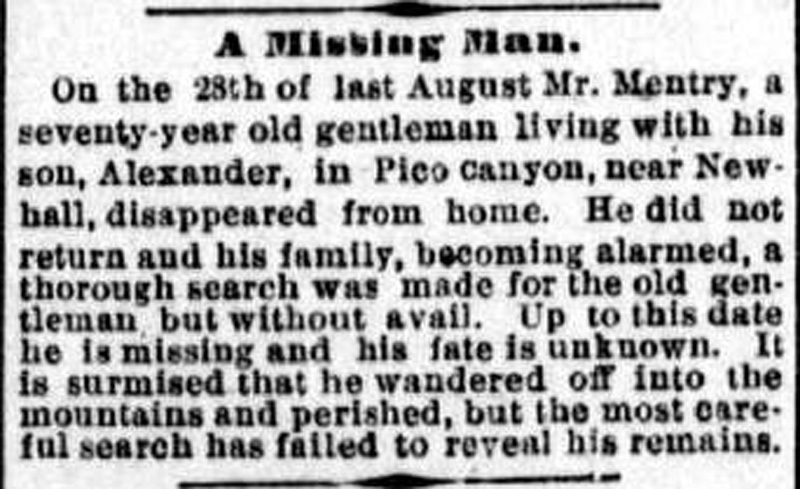 According to contemporary news reports, it seems the famous oil driller, Charles Alexander Mentry, had his father living with him at Pico when, in 1886, the elder man — Peter Mentriey, aka Mentre, age 77 — went missing. A dozen years later his skeleton was found on a local mountaintop. Los Angeles Herald | Thursday, November 11, 1886. On the 28th of last August Mr. Mentry, a seventy-year old [sic: s/b 77] gentleman living with his son, Alexander, in Pico Canyon, near Newhall, disappeared from home. He did not return and his family, becoming alarmed, a thorough search was made for the old gentleman, but without avail. Up to this date he is missing and his fate is unknown. It is surmised that he wandered off into the mountains and perished, but the most careful search has failed to reveal his remains. Los Angeles Herald | Friday, March 17, 1899. The skeleton of a man who has been dead for more than twelve years was found on the top of a high mountain ridge, four miles east of Newhall, Wednesday afternoon. The remains were those of Peter Mentre, and although Coroner Holland was notified of the find he refused to hold an inquest, inasmuch as the skeleton was identified by a son of the deceased. In the finding of the bones there was solved a mystery which puzzled the residents of Pico canyon for several months in 1886. 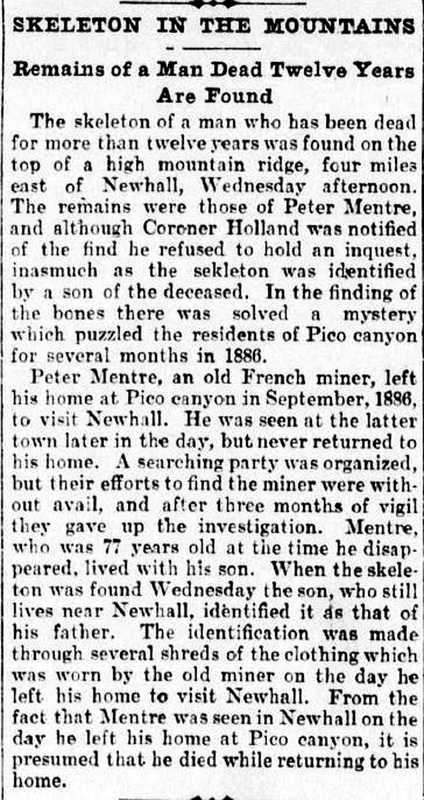 Peter Mentre, an old French miner, left his home at Pico canyon in September, 1886, to visit Newhall. He was seen at the latter town later in the day, but never returned to his home. A searching party was organized, but their efforts to find the miner were without avail, and after three months of vigil they gave up the investigation. Mentre, who was 77 years old at the time he disappeared, lived with his son. When the skeleton was found Wednesday the son, who still lives near Newhall, identified it as that of his father. The identification was made through several shreds of clothing which was worn by the old miner on the day he left his home to visit Newhall. From the fact that Mentre was seen in Newhall on the day he left his home at Pico canyon, it is presumed that he died while returning to his home. Mysterious Disappearance of Twelve Years Ago Explained. Los Angeles Times | March 17, 1899. The bones of Peter Mentre, who mysteriously disappeared from the home of his son in the Pico Cañon, were found day before yesterday in the mountains about four miles from Newhall, where they had lain for more than twelve years. One bright September day in 1886, the old man left the home of his son with whom he had been living, to walk to Newhall and return, upon some light errand. That was the last ever seen of him. After waiting a reasonable length of time for his return, the son took the trail to hunt for his missing sire. He was joined in the search by neighbors, and for three weeks the mountain sides and ravines in the neighborhood of Newhall were scoured for some trace of the missing man, but not a sign pointing to his fate was ever discovered. At last the search was abandoned and the incident was wellnigh forgotten until a wanderer in the mountains last Wednesday came across a human skeleton and some shreds of clothing on a high ridge about four miles east of Newhall. The remains were identified by the few rags and trinkets accompanying them as those of Mentre. Coroner Holland was notified by telephone of the find, but he did not deem an inquest necessary. Peter Mentre was a native of France and was 77 years old at the time of his disappearance. His son, who sill resides in Pico Cañon, where he is employed as an engineer at the oil wells, is satisfied that the bones found are those of his father, and has given them decent burial. The spot wehre the bones were found is close by the trail leading from the cañon to Newhall. The supposition is that the old man, after climbing the ridge, either going to or returning from Newhall, lay down under a lump of bushes near the path to rest, and died from a sudden attack of illness or exhaustion. Warren (Penn.) Times Mirror | February 4, 1931. The following item of interest appeared in the Meadville Tribune-Republican on Saturday: "Mrs. Florence E. Praul, formerly of Mt. Hope Crawford county, now living at Santa Paula, Cal., writes the Tribune-Republican that recently a tablet was put in place near Newhall, Cal., to mark the spot where her uncle, Alexander Mentry, drilled the first [sic] oil well in California about 57 years ago, and the well is still producing at the rate of about one barrel a day. Alexander Mentry, a native of France, formerly lived in Mead township one mile south of Frenchtown, and learned the trade of blacksmith in his father's shop way back in the sixties. The son worked for several years in the Pennsylvania oil regions and in September, 1873, left for California and became noted as an oil producer. He died in the autumn of 1900 and during his life a town called Mentryville was named in his honor. Money for the purchase of the tablet was collected by grandchildren of men associated with Mr. Mentry in the oil business. Peter Mentry, father of the man who became prominent in oil production in California, left Crawford county in September, 1883, to make his home with his son. The father was torn to pieces by a mountain lion while hunting in that state."